In past weeks we have examined receiver hitches and travel trailer hitches as well as the rolls they play in having a safe and enjoyable camping trip. 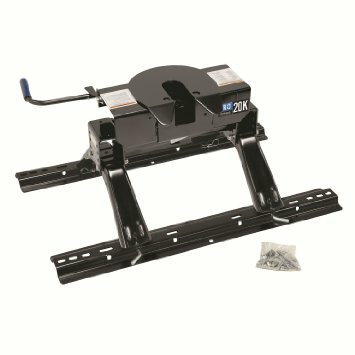 Today we are looking at the other major type of hitch commonly found in RVs, the fifth wheel hitch. 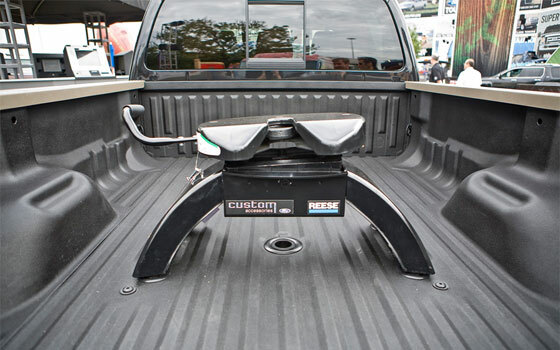 Instead of using a receiver and hitch assembly like a travel trailer, fifth wheel rvs connect to the tow vehicle using a special hitch installed in the bed of the tow vehicle. There are various way that this connection can be accomplished. Whether it is with a conventional rail mounted fifth wheels hitch, a roller or slider hitch, an under mount adapter, or a gooseneck, fifth wheels are usually easier to tow. 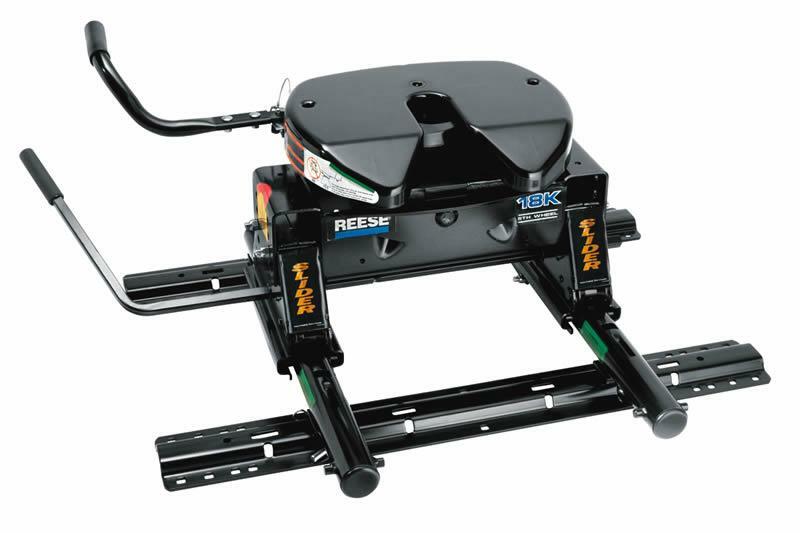 This improved ease of towing is a result of changing the hitching point; a properly installed fifth wheel hitch will place the hitch weight, also known as tongue weight, squarely over the rear axle of the tow vehicle. Before considering the type and rating of fifth wheel hitch for your truck, it is important to know several key number. First and foremost, it is important to know the towing and load capacities of your pickup truck. Secondly it is important to know the unloaded vehicle weight rating (UVWR) as well as the hitch weight of the fifth wheel you plan to tow. Be sure your truck and the hitch you ultimately select are rated for the amount of weight you intend to tow. This is the most common fifth wheel hitch install type. Using a bracket kit specific to the year make and model of your pickup truck, a set of rails are installed in the bed of you truck. Even when the fifth wheel hitch is not installed, the rails remain installed. Fifth wheel slider hitches are necessary when either the tow vehicle is a short box truck or fifth wheel rv with a particularly squared off front profile. In extreme maneuvering situations, such as pulling into a driveway or a campsite, the slider hitch allows the hitch point to move behind the rear axle, allowing extra space between the cab of the truck and the front of the towed fifth wheel. Slider hitches come in both automatic and manual varieties. With a manual setup when you arrive at your destination you would unlock the slider on the rails, manually engage the brakes on the fifth wheel, slowly pull forward to re-position the hitch in the truck bed, and lock the hitch in the maneuvering position. Then before getting back on the road, the process is reversed to return the hitch to the towing position. With an automatic slider this is handled mechanically with no user adjustment required. Keep in mind when shopping for slider fifth wheel hitches that automatic models can cost up to $1,000 more than their manual and fixed counterparts. In a gooseneck towing solution a ball is secured over the axle of the tow vehicle and an adapter is attached to the pin box of the fifth wheel. Gooseneck hitches are more prevalent in applications where the tow vehicle is already equipped with a gooseneck ball; goosenecks are commonly used for car haulers, horse trailers, and other agricultural applications. 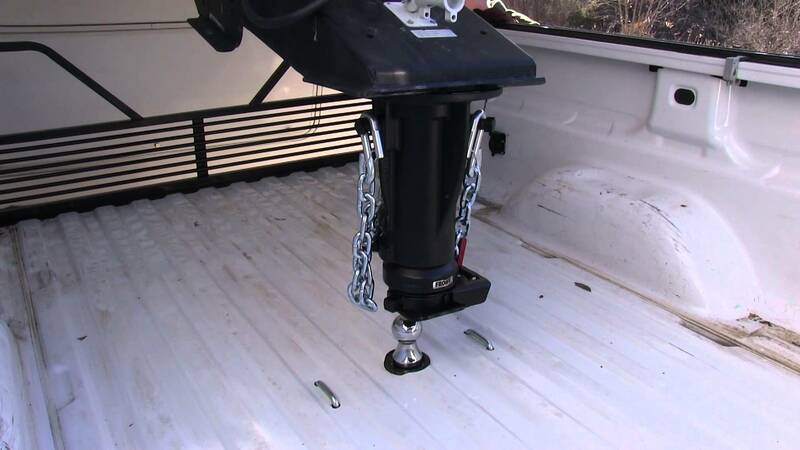 There is at least one solution to convert a gooseneck ball in to a full fifth wheel hitch, the B & W Companion™ Hitch is easily the best know product to accomplish this task. With the ever increasing popularity of fifth wheel rvs, most 3/4+ ton truck have a factory option of a fifth wheel mounting kit. These provide all the blot receptacles needed to fasten a fifth wheel hitch or a gooseneck ball to your truck, already attached to the frame, with access point in the bed of the truck. This is particularly valuable if you know you will be using your truck for more than just towing your fifth wheel RV. Hopefully this series of articles has helped to identify the types and applications of all the hitches commonly used to tow RVs. Happy Camping!